MSE Creative Consulting Blog: What Are These Emergency Vehicles Doing? 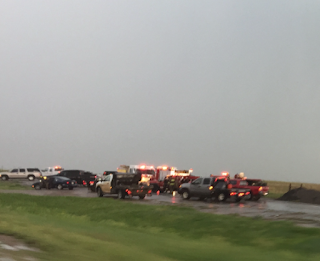 This poor quality photo of mine from Tuesday's storm chase in southwest Kansas reveals a couple of fire trucks, an ambulance and a couple of tow trucks. What were they doing there, mixed in with a number of storm chasers? My educated guess is they were getting them out of harm's way in case the town of Minneola was struck by a tornado during yesterdays warning. The emergency management of Greensburg made a similar decision ten years ago that was highly successful. The emergency management of Minneola had ample reason for such an action. The tornado barely missed the city to the south as the illustration below shows. Rotational motion as measured by radar. 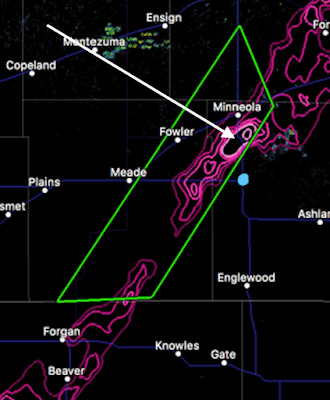 Arrow shows the high rotation associated with the brief tornado just south of Minneola. 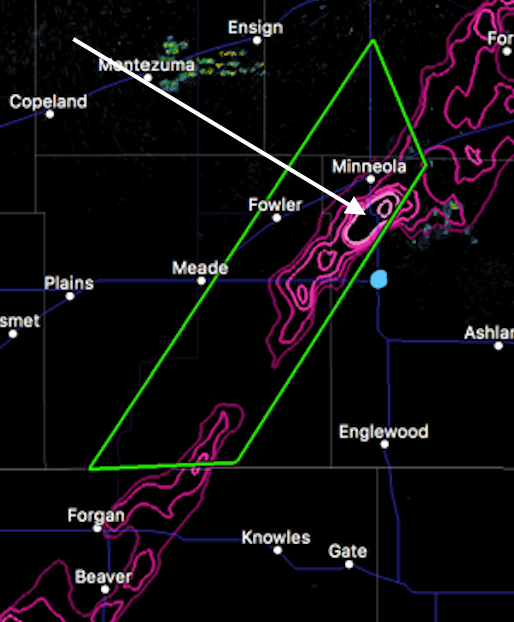 The green polygon is a later flash flood warning. I do have one concern: The officials making the decision to move the emergency equipment need to have a reliable way to insure they are not moving into the path of danger and must have sufficient time to get the vehicles out of the path of the tornado. In this case, they moved the equipment to the blue dot. It might have been better to go west or north, rather than crossing the tornado's eventual path. At AccuWeather Enterprise Solutions, we routinely advise a number of counties and communities when such a threat presents itself. Regardless, congratulations to Minneola on getting their equipment out of the path. Yes, Mike, that's exactly what they were doing. There were units from Minneola, Ashland and Clark county there. My Suburban is the one at the left edge of the photo. They had been there for quite some time when you passed and took that photo. We sat there from 1619 until 1754 and most of them were there half that time or more. They were out of the way good and early. I don't know if some also went north or west. For some reason my profile info isn't coming in...this is Scott Roberts.